Here is a bunch of gorgeous premium Roses, Baby rose with leaves in Glass vase. Arranged in a glass vase and delivered to their door in an ultimate romantic gesture. The glass vase is arranged with 8 Roses, 10 Baby rose with leaves in Glass vase. This can turn into the most beautiful and precious gift for your loved ones. It’s perfect for Birthdays, Anniversaries, Valentine’s or any special occasions. Shop gifts online and send to your dear ones in Dubai – UAE. Flowers, Cakes and Gifts delivery in Dubai. There might be a slight variation in the product in terms of shape or design as per availability. Flowers are seasonal. If the featured item is not available we will deliver another item at same coast. 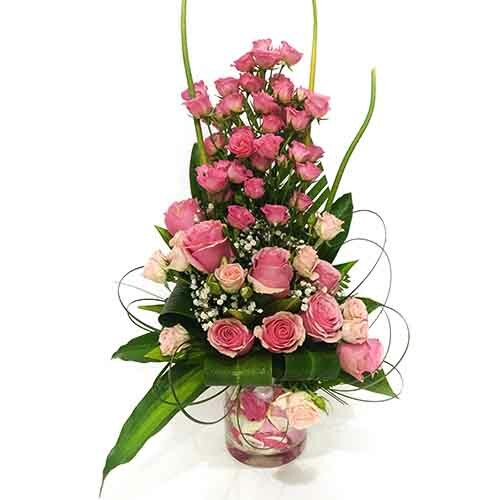 SKU: 1FLR014 Category: Flowers. Tags: Dubai Flower Shop, Dubai online Flower shopping, Flower Delivery in Dubai, Flower Delivery In UAE, Flower Gifts Delivery In UAE, Flower Vase, Flowers, Flowers Online, Online Flower Delivery, Online Flower Delivery In UAE. This looks pretty decent. I like the colors of the flowers and i like the arrangement.